1 Bdr Deluxe - Min 5 Nights Book Max 2 People plus baby/child Spacious self contained themed apartments with king bed and spa bath, separate shower, airon, lift access, security car parking. There are 2 balconies one off the living area and one off the bedroom. Max occupancy 2 persons per apartment. The apartments are north east facing. Apartments available from level 3 to 6. 2 Bdr Deluxe - Min 5 Nights Book Max 4 People Fully self contained 2 bed Apartment. King size bed in main bedroom, ensuite, spa bath & sep. shower in 2nd bathroom. Free Foxtel. 2nd bedroom has 2 single beds. Air con. Max 4 people. WiFi available at reception. Apartments available from level 3 to 6. 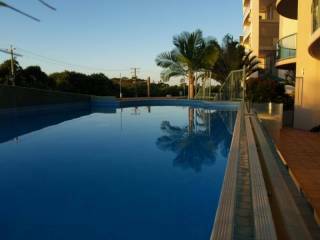 1 Bdr Pool/Garden Min 3 Nights Book Max 2 people. 1 bedroom levels (1 or 2) with garden & pool views or side. 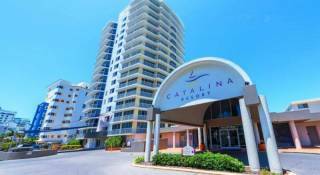 Reverse aircon, Foxtel, WiFi available at office, Free security car parking, walking distance to eateries & shops. 1 Bdr Deluxe - Min 3 Nights Book Max 2 People plus baby/child Spacious self contained themed apartments with king bed and spa bath, separate shower, airon, lift access, security car parking. There are 2 balconies one off the living area and one off the bedroom. Max occupancy 2 persons per apartment. The apartments are north east facing. Apartments available from level 3 to 6. 2 Bdr Deluxe - Min 3 Nights Book Max 4 People Fully self contained 2 bed Apartment. King size bed in main bedroom, ensuite, spa bath & sep. shower in 2nd bathroom. Free Foxtel. 2nd bedroom has 2 single beds. Air con. Max 4 people. WiFi available at reception. Apartments available from level 3 and 6. 1 Bdr Deluxe - Min 2 Nights Book Max 2 People plus baby/child Spacious self contained themed apartments with king bed and spa bath, separate shower, airon, lift access, security car parking. There are 2 balconies one off the living area and one off the bedroom. Max occupancy 2 persons per apartment. The apartments are north east facing. Apartments available from level 3 to 6. 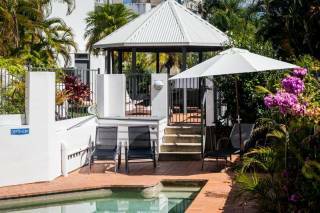 2 Bdr Deluxe - Min 2 Nights Book Max 4 People Fully self contained 2 bed Apartment. King size bed in main bedroom, ensuite, spa bath & sep. shower in 2nd bathroom. Free Foxtel. 2nd bedroom has 2 single beds. Air con. Max 4 people. WiFi available at reception. Apartments available from level 3 to 6. Myconos Resort Apartments - Unique Holiday Accommodation located perfectly in Cotton Tree - The beachside suburb of Maroochydore and central to a wonderful variety of bistros, cafes, restaurants, pubs and clubs. Maroochydore is the main CBD and shopping centre of the Sunshine Coast. Maroochydore's Sunshine Plaza is easy walking distance and has Myer, Cinemas and an enormous number of retailers boasting quality, and diversity. Leave your car and walk everywhere. 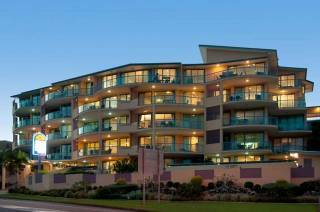 Myconos Resort Holiday Apartments are located on the Sunshine Coast's best beachside walking track that wraps from Cotton Tree to Mooloolaba. 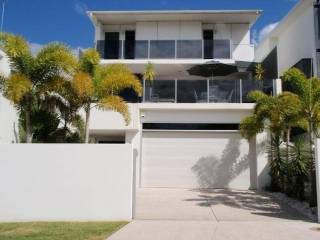 It overlooks the famous surf beach of Maroochydore and the new diving sensation HMAS Brisbane in front of Maroochydore and Old Woman island. Terms & Conditions CHECK - IN AFTER 2 pm. CHECK - OUT BEFORE 10 am. OFFICE HOURS: MONDAY TO FRIDAY 8 am TO 5 pm. SATURDAY 8 am TO 3 pm. SUNDAY 8.30 am TO MIDDAY PLEASE ADVISE BY EMAIL YOUR ETA. CREDIT CARD DETAILS TO SECURE BOOKING REQUIRED ON BOOKING. ACCOMMODATION MUST BE PAID IN FULL ON ARRIVAL. WE REQUIRE CREDIT CARD DETAILS FOR SECURITY ALSO DRIVERS LICENCE ON ARRIVAL. IF NO CREDIT CARD HELD A BOND OF $100 IN CASH REQUIRED. ONCE A BOOKING PERIOD HAS COMMENCED NO REFUNDS WILL BE MADE. If a cancellation is within 30 days of arrival there will be no penality. If cancellation is 7 days the administration fee will be first nights accommodation.